Prof Dietmar Müller, Dr Nicolas Flament and Dr Simon Williams. Current plate tectonic models view plates as rigid blocks. However the Earth’s crust isn’t always rigid, it can stretch (such as at rift zones) or compress (such as at convergent plate boundaries). My research involves helping improve our plate models by implementing deforming zones at plate boundaries. The areas I will be looking at in particular are the Tethyan mountain ranges which cover deformation caused by the collision of Africa-Eurasia (the Alps), Arabia-Eurasia (Zagros Mountains) and India-Eurasia (the Himalayas). Furthermore, I will use the deforming models to give an idea of the evolution of topography over time which will help us understand the temporal evolution of dynamic topography. An understanding of the evolution of dynamic topography for the Tethyan orogens will help as gain valuable insights into the evolution of sedimentary basins in these regions. See below for EarthByte content related to Jonathon. 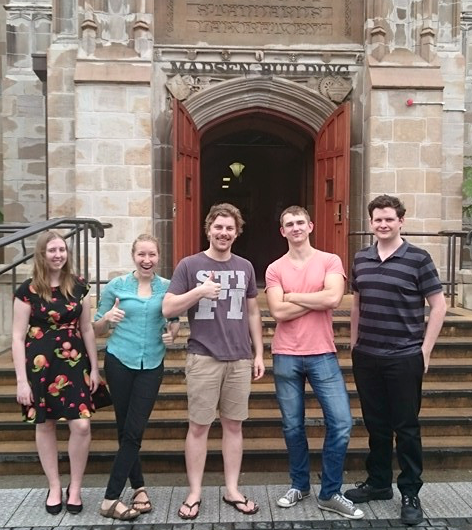 Congratulations to the EarthByte Honours students for submitting their theses and delivering their final presentations! Well done Carmen, Mandi, Jono, Nikita and Luke! EarthByte is happy to welcome 5 new Honours students who will be undertaking a variety of exciting projects over the course of the next 9 months! Welcome Mandi, Jono, Luke, Carmen and Nikita!